Jane Eyre, Sputter Sputter, Jane Eyre : Blog Of The Nation Sebastian Faulks sees Jane Eyre as a morally upright, mouse-y little thing, with her happiness dependent entirely upon marriage with Mr. Rochester. Boy, did he miss the point. Good thing Salon's Laura Miller can take him to task. The first page of the manuscript of Charlotte Bronte's Jane Eyre. I really love Sebastian Faulks — I think he's a great writer, and I adore his novels, especially Birdsong. (But please, set your novel in Europe during a World War, give me some romance, good prose, and the possibility of a major motion picture, and I'm yours.) He's got a new book, Faulks on Fiction: Great British Characters and the Secret Life of the Novel, which I haven't read, but has been excerpted in the Daily Telegraph extensively. Just reading the subtitle of the book makes me close my eyes and shiver in delight. But when I read the second excerpt published by the Daily Telegraph, all about Vanity Fair's Becky Sharp, I must admit: reader, I sputtered. Jane Eyre is a resilient woman, of higher moral calibre than Becky Sharp, but her happiness, and her psychological "completion", seem to depend on her securing the love and companionship of another, Mr Rochester. All her battles from the orphanage onwards, with whatever doughty and feminist intelligence they are fought, are presented as leading to this one end. Um, WHAT!?! Did he read the book!? What did he think Jane was doing wandering around the moors — STARVING — as she made her way away from Thornfield Hall? SEARCHING FOR A HUSBAND? Sometimes when I am so fired up that I am lightheaded and red in the face, I am unable to make a graceful argument. When that happens and it is book-related, I can usually count on Salon's Laura Miller to publish a cogent response. And should we ever disagree, I'm willing to be convinced by her. And, sure enough, her response to Faulks goes straight to the target. 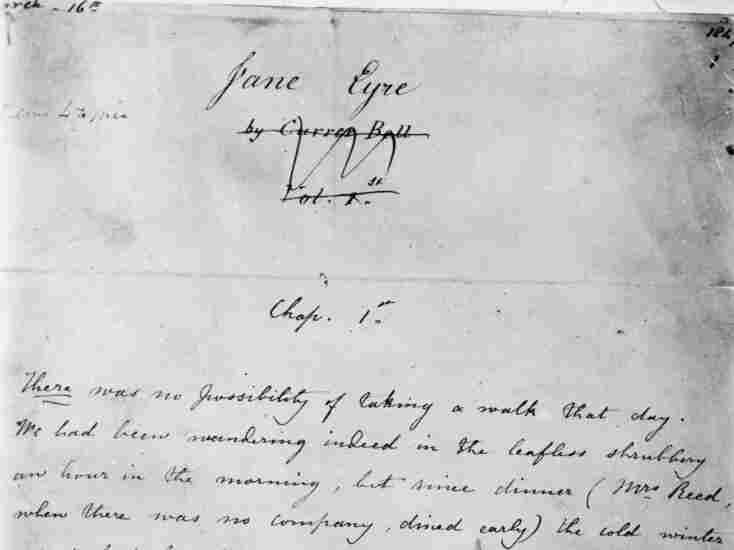 The pivotal moment in Jane Eyre is not the one in which the Byronic Mr. Rochester professes his love for the "poor, obscure, plain and little" governess and asks her to marry him. Rather, that moment comes after Jane learns that she can't wed the man she loves because he is already married (to a madwoman, whose existence he has concealed from her). Rochester attempts to keep Jane by suggesting they run away to France together, but she refuses. She flees his house and, without family or other protectors, the penniless young woman is soon reduced to beggary, grateful to eat scraps originally intended for pigs. RIGHT. Like I SPUTTERED. Of course, than Miller goes on to actually make the case. This episode is only one of a series — including the chapters devoted to Jane's childhood amid unloving relatives, her years in a harsh boarding school, and the weeks when, having been rescued by a family of a devout Calvinists, she contemplates life without Rochester — that describe not Jane's quest for love but her assertion of her autonomy in a world that regards her as entitled to none. In the past, Jane rebelled against authority figures to defend the legitimacy of her feelings, but when she leaves Rochester, it is her own desires that she defies, this time on behalf of her principles. I still love Faulks, and, for the record, I love Becky Sharp and many, many Victorian femme fatales as well. But, to ignore Jane Eyre's essential independence and even rebelliousness, especially in comparison to the Becky Sharps of that world, is to perpetuate that boring, yet tenacious good girl/bad girl stereotype. Sure, bad girls are exciting and defiant and make their own rules — and so do good girls.